Growth hacking and growth marketing have been buzzing around Silicon Valley’s startup world since 2012 and for the last few years the discipline is on a rise globally. Multiple start ups, scale ups, corporates and organisations have applied growth process and revolutionised the way they do business. Mad Kings growth hacking agency perfected a tool Growth Marketing Canvas, which empowers companies to build a growth strategy and a growth process. We have proven over 100 times that it works in practice, so you can just go ahead and use it. Growth hacking is pretty cool. BUT how do I get jump onboard? “Growth hacking is not a bag of tips and tricks. It is a process”. The question remains, where to start and how to give the growth process a fair chance to show results in your company or an organisation? You came to the right place- we have proven this model to work amazingly well with over 200 companies. Similarly to business model canvas, growth marketing canvas was designed to help teams to first develop a broad overview of their business and later on to provide a structure for brainstorming, which provides hand-on experiment ideas needed to kick-off growth operations in a company. Since 2016 MAD Kings team is helping companies to adapt their processes and assign the right people to newly established growth teams by offering frameworks, coaching, education and process support. 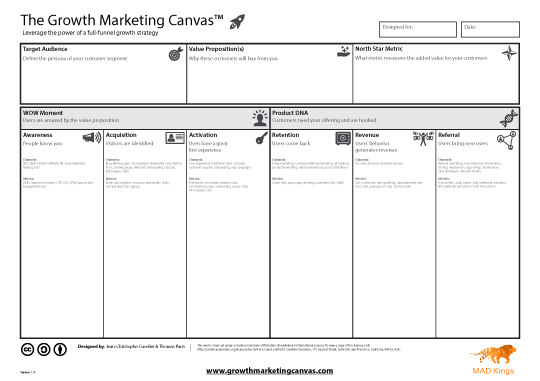 One of the most appreciated models by the companies we work with is growth marketing canvas. We believe that growth marketing canvas is a tool that benefits everybody. It is simply a human nature. To offer guidance and commitment for all growth enthusiasts who need help getting started with a growth process in their companies, MAD Kings offers a 1-day in-house training, which is guaranteed to give you at least 50 growth experiment ideas, which is more than an average company invested in growth does in a year 🙂 The majority of teams that we work with generate at least 100 experiment ideas at the workshop, some even 200. And yes, quality beats quantity every time, so the workshop is not all about generating ideas, but also learning how to prioritise them and implement them following growth methodology. If you are a freelancer, entrepreneur or a person working at a startup company, you can learn the powerful logic of applying growth marketing canvas to kick-start your growth process at a 2-day Growth Hacking lecture. There is much more content, you will learn growth hacking in a very holistic and well-structured manner, however, growth marketing canvas is a backbone of this workshop, which we organise twice a year in Brussels. Do you want to teach how to use the Growth Marketing Canvas in your area? The become a certified Growth Marketing Canvas trainer. After a 1-day training in Brussels, you will receive the trainer toolkit and be referenced on our website as official Growth Marketing Canvas trainer. Basically, we needed to be able to ideate on each aspect of the conversion funnel with our customers. We’ve tried other tools, but there is a tendency to over-complicate canvas with a lot of blocks that were not useful. So we decided to build our own and to keep it as simple as possible. With many iterations and tests with customers, we’ve created the only Growth Marketing Canvas. Companies across the world can be divided into 2 categories. The ones that have a solid growth strategy and the ones that don’t. Thing is, developing an ambitious growth strategy can get extremely overwhelming as the amount of ideas to test is infinite. This had always been a huge struggle for me and it’s part of the reason why my first company never took off. That’s why I decided to build a framework that would help businesses ideate about their growth in a structured and meaningful way. The power of the Growth Marketing Canvas comes from its customer centricity and its ability to use the collective intelligence to bring up innovative and relevant ideas that all departments agree with. Download the Growth Marketing in a PDF today and receive future updates by mail!